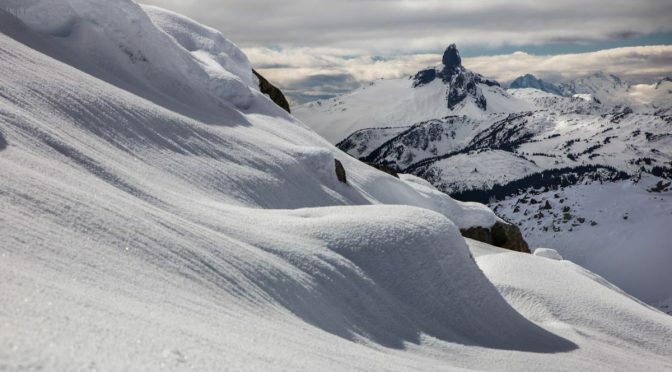 Whistler (BC), Canada – A powerful atmospheric river of moisture has been pouring in off the Pacific Ocean in recent days, leaving up to two feet of snow on mountains from British Columbia to the Sierra Nevada. Whistler Blackcomb is reporting the deepest snow totals, with over 75 cm (nearly 30″) reported at higher elevations. Mammoth Mountain officials say that with winds gusting in excess of 100 m.p.h. at the summit, it’s difficult to measure snow totals but they estimate one to two feet at the summit, and four to six inches at the base at Main Lodge. Snowfall was very elevation dependent with this storm; snow levels dropped throughout the storm, and the deepest amounts by far were found at the highest elevations at the highest ski resorts. Here’s a sampling of snow photos from around the region over the past two days to get your stoke on, as the new season approaches!